I guess Japanese people are the ones in the world most likely to wear protective masks. Many people in developing countries suffering from an excess of air pollution and exhaust fumes also wear masks when riding motor bikes, the common form of transportation. 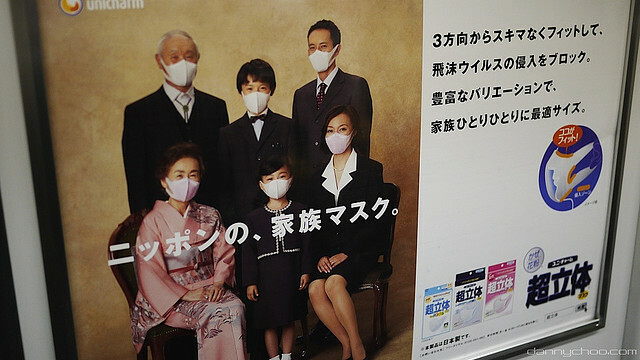 Most people of course wear masks for health reasons in Japan as well. However, a variety of masks have recently appeared on the market, and Japanese women now wear masks for a wider variety of reasons. So, today I would like to share some of them. Kowa Company Ltd. produces herbal scented masks (5 varieties: rose, jasmine, lavender, camomile, and bergamot). These masks would be perfect for surviving in jam-packed trains full of foul odors! 3) For covering a face with no make-up. According to a recent survey targeting 1000 women (from teenagers to those in their 30’s), 87% answered YES when asked “Do you wear a mask for any other purposes than hygienic reasons?” And the most major purpose was “to hide their my plain, un made-up face”. I totally understand. How handy!